Dow futures for Tuesday, April 7, forecasted a 22-point gain from yesterday's strong close. As first-quarter earnings season kicks off, investors are keeping an eye on oil prices and statements from members of the Federal Reserve. On Monday, the DJIA Index gained more than 144 points, fueled by a surge in oil prices and soft data that hints the Federal Reserve will likely avoid an interest rate hike in June. Friday's weak March employment report pushed PNC Financial Services to delay its expected target rate date back to September. The S&P 500 Volatility Index (VIX), the market's fear gauge, dipped 0.4% on the day. In commodities, gold prices jumped 1.3%, while silver prices gained 1.7%. The weak unemployment report dented expectations of a rate hike, which added a jolt to precious metals. Oil Prices Today: Oil prices surged yesterday after optimism faded over the benefits of a pending nuclear deal between the United States and Iran. Energy analysts concluded that any deal would still require Iran at least a year to bring its oil production back online to a reasonable level of capacity. 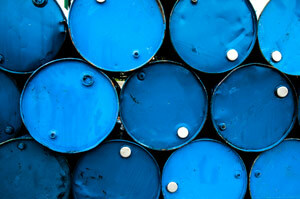 Brent oil slid 0.2% this morning to $57.99 per barrel. WTI crude declined more than 0.8% to hit $51.68 per barrel. Investors are anticipating tomorrow's release of minutes from the most recent FOMC meeting, as we begin to parse through the wording for any clues of when the Federal Reserve may raise interest rates. Following Friday's weak jobs report, it's increasingly unlikely that the central bank would take action in June. However, following the recent meeting, a few notable members said there was a "strong case" for the bank to raise rates sooner than later. This morning, two members of the Fed, William Dudley and Narayana Kocherlakota, will offer separate speeches on the economy. Today will feature a critical consumer credit report in February. Analysts anticipate that non-revolving debts will continue to rise, particularly in student debt. Today, a critical final March report on the European service sector will be released for the continental bloc. In addition, Europe will unveil the primary price index levels. Pre-Market Movers No. 1 RIG: Shares of oil field services giant Transocean LTD (NYSE: RIG) retreated 2.1% this morning after a double-digit gain yesterday. RIG shares surged on Monday after oil prices jumped more than 5.2%. Falling oil prices have hammered shares of RIG and its oil field services rivals since June as energy companies cut back on capital expenditures and reduce rig counts. The stock has fallen more than 46% since October. Pre-Market Movers No. 2 INFA: Shares of data integration software marker Informatica Corp. (Nasdaq: INFA) were up more than 4.5% this morning on news the company is being taken private in the largest leveraged buyout of 2015. Private equity firm Permira and the Canadian Pension Plan Investment Board will purchase the firm for $5.3 billion or $48.75 per share. Pre-Market Movers No. 3 FDX: Shares of FedEx Corp. (NYSE: FDX) jumped more than 5.8% this morning on news the company will purchase Dutch shipping rival TNT Express NV (OTCMKTS ADR: TNTEY) for 4.4 billion euros ($4.8 billion). TNT Express is Europe's largest shipping company, and the deal gives FedEx a stronger hold in the continent's markets. The deal is a bit of a blow for rival United Parcel Service (NYSE: UPS), which had attempted to purchase TNT Express two years ago for 5.2 billion euros, but regulators rejected the deal. Stocks to Watch No. 1 SEAS: SeaWorld Entertainment Inc. (NYSE: SEAS), the theme park and entertainment company, is launching a public awareness campaign to beat back accusations of animal cruelty and other "misinformation," as the firm describes it. The stock rose more than 2% on Monday. Stocks to Watch No. 2 VIAB: Shares of Viacom Inc. (Nasdaq: VIAB) were down 1.6% today on news that the media conglomerate plans to lay off staff and restructure the firm. It also announced plans to halt a $20 billion stock buyback program for several months as the reorganization takes place. The firm owns Paramount Pictures, Comedy Central, and other outlets. Stocks to Watch, Earnings Roundup: Investors can expect earnings reports today from Dave & Buster's Entertainment Inc. (Nadsaq: PLAY), Greenbrier Company Inc. (NYSE: GBX), Team Inc. (Nasdaq: TISI), and Mitcham Industries Inc. (Nadsaq: MIND). New York Federal Reserve Bank President William Dudley gives a speech at 8:30 a.m..
Minneapolis Federal Reserve Bank President Narayana Kocherlakota gives a speech at 8:50 a.m.
3-Yr Note Auction at 1 p.m.